Blume P., Walters J., Payne W., Ayala J., and Lantis J. This was a multi-center randomized controlled efficacy trial of 342 diabetic subjects who were followed for a minimum of 112 days. 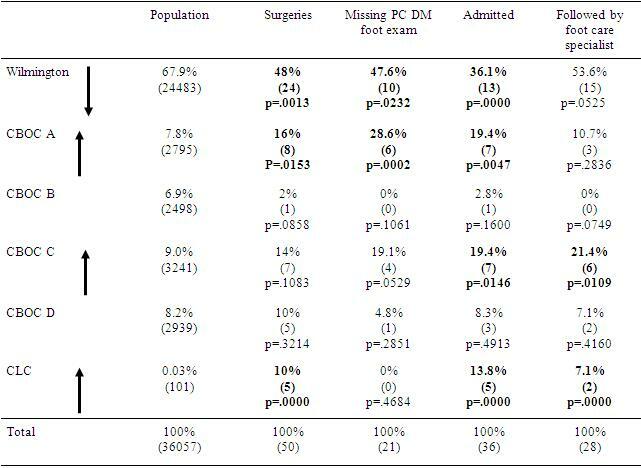 The study was performed across 37 diabetic foot clinics and hospitals principally in the United States. The primary outcome was complete ulcer closure. There was a thorough description of the method of randomization as well as, concealment allocation. Subjects and investigators were not blinded and it was unclear if data collectors and analysts were blinded. Safety and effectiveness analysis was conducted by the company sponsoring the study. A sample size calculation was carried out with the expectation of a 20% difference between groups (Absolute Risk Reduction). Enough subjects were enrolled in the study to satisfy the sample size calculation. Baseline data examination reveals no difference between groups. Data from the primary outcome were analyzed as intention to treat as well as, per protocol. Efficacy of the intervention was reported as statistically significant both for intention to treat and per protocol analysis favoring the vacuum assisted closure method. Point estimates were reported for the primary outcome but 95% confidence intervals were not reported. The manufacturer of the wound closure vacuum assisted device (KCI) supported the study. It was not indicated if the study was registered. The primary author has received payments from the manufacturer for speaking engagements. No other disclosures were noted for other authors or investigators. The article has been marked as an advertisement by the publisher. The study contains several well described methodological techniques to limit bias, randomization, concealment allocation, and intention to treat analysis. However, due to the nature of the study investigators and subjects were unable to be blinded. Although unblinded studies are associated with an increased treatment effect this is less likely when the primary outcome is objective such as resolution of an ulcer as opposed to soft measurements such as patient reported outcomes. However, no mention was made regarding blinding of data collectors and analyzers. The data from the study was analyzed by the company funding the study. This may be perceived as a potential source of bias, it is more reassuring to the reader when the data is analyzed by a neutral third party. The results of the primary outcome were presented as intention to treat and per protocol. It appears the author chose to assign the worst case scenario for the data lost to follow-up for the ITT analysis. Both methods were statistically significant however differed in their point estimate. Was this study clinically significant? The authors expected a 20% difference (ARR) between groups when they calculated their sample size. If the 20% difference is to be accepted as a clinically significant result then the result of the primary outcome using the intention to treat analysis was not clinically significant but only statistically significant. The per protocol analysis was both clinically and statistically significant. Furthermore, it is difficult to analyze the results with only point estimates and not 95% confidence intervals (CI). Why 95% CI were reported for secondary measures and not the primary outcome was unclear. There appears to be a fairly high loss to follow-up in both arms of the study (approximately 30% per treatment arm). The prognosis for subjects lost to follow-up is thought to be different than the patients who remain in the study. This loss of data may compromise the randomization sequence. Did the loss of follow-up effect the results of the study? The strength of the inference drawn from the study is modified by the magnitude of the difference between the intention to treat and per protocol analysis. It would have been instructive for the reader if the authors addressed this point during their discussion of the results. Interpretation the study’s results would be better understood with a clear clinically important difference stated by the authors and with 95% CI reported about the point estimate of the primary outcome. The ARR only exceeds 20% during the per protocol analysis. 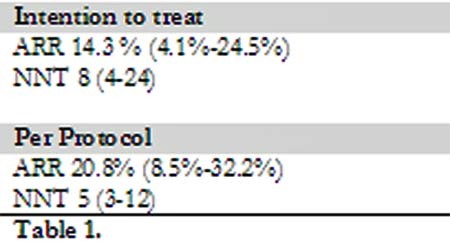 The lower end of the 95% CI for both ITT and PP is greater than 0 which is consistent with a statistically significant result. Although the point estimate (ARR) for the intention to treat analysis is less than 20% , a risk reduction of more than 20% cannot be ruled out by evaluating the upper end of the 95% CI and would suggest a larger study is necessary or less loss of follow-up. The NNT is a more clinician friendly metric to access efficacy in studies with dichotomous outcomes. The NNT for both are similar 5 (PP) and 8 (ITT) however, the upper limit of the 95% CI or worse case scenario is 12 (PP) and 24 (ITT). This appears to be a large difference. Although the use of the vacuum assisted closure appears to be more efficacious the magnitude of the effect is unclear and the inference reduced. It is up to the reader to determine if the loss to follow-up, lack of blinding and lack of clinical significance reduces the inference of the results of this study. In addition, since the study was designed as an efficacy rather than an effectiveness study, generalizing the results to clinical practice should be undertaking with caution. 1. Woods L, Egger M, Lotte Gluud L, Schulz KF, Jüni P, Altman DG, Gluud C, Martin RM, et al. Empirical evidence of bias in treatment effect estimates in controlled trials with different interventions and outcomes: meta-epidemiological study. BMJ 336 (March): 601 – 605, 2008. 2. Montori VM, Guyatt GH. Intention-to-treat principle. Can Med Assoc J 165 (10): 1339 – 1341, 2001. 3. Graphpad. http://www.graphpad.com/quickcalcs/NNT1.cfm Accessed 11/3/2008. 4. Gregor S, Maegle M, Sauerland S, Krahn JF, Peinemann F, Lange S. Negative pressure wound therapy a vacuum of evidence? Arch Surg 143 (2): 189 – 196, 2008. 5. Bell G, Forbes A. A systematic review of the effectiveness of negative pressure wound therapy in the management of diabetes foot ulcers. Int Wound J 5 (2): 233 – 242, 2008. We report a rapidly spreading necrotizing foot infection in a healthy 37 year old male with associated sepsis and no identifiable portal of entry. 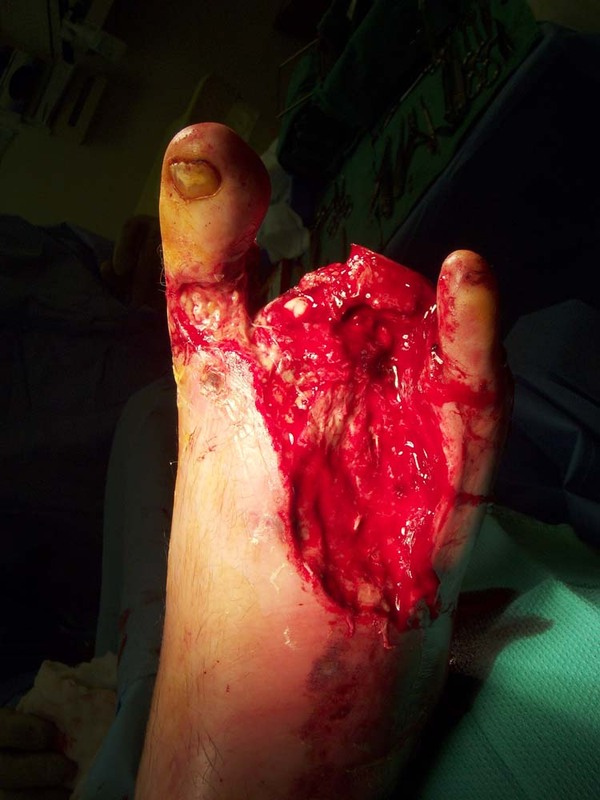 Multiple debridements were required to control this infection which eventually necessitated a LisFranc’s amputation. 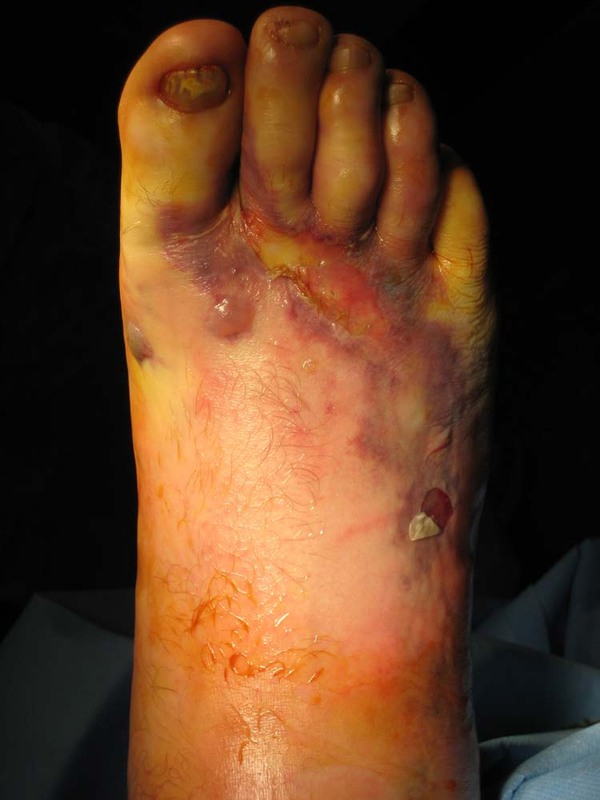 We review the current literature of the diagnosis and treatment of necrotizing soft tissue infections in the foot. Early diagnosis and appropriate treatment can preserve life and limb. Necrotizing soft tissue infection or (NSTI) is a broad term that comprises a rare group of limb and life-threatening surgical emergencies. We report on an unusual case of a 37 year old, otherwise healthy male, who presented with a NSTI without a portal of entry. First described by Confederate army surgeon Joseph Jones in 1871 as “hospital gangrene,”  this condition is caused by a variety of organisms. These infections require operative debridement and appropriate antibiotic therapy, as well as fluid resuscitation and other supportive care. The term “necrotizing fasciitis” was coined by Wilson in 1952. Today, most authors prefer the term “necrotizing soft tissue infection,” or NSTI. A 37-year-old white male presented to the Emergency Department complaining of a very painful and swollen right foot. The patient noted that the swelling and pain had been increasing to the lower leg and up to the knee. There had been increasing redness and some clear drainage from the right foot. The patient had been evaluated at an urgent care clinic five days earlier with a complaint of severe pain to the arch. At that time, there was no evidence of an infectious process and the patient was diagnosed with plantar fasciitis. He was given a non-steroidal, anti-inflammatory and a narcotic for pain. Figure 1 The initial presentation of the foot. There is extensive cyanotic skin changes and bullae formation. Ecchymosis was observed at the medial plantar arch and the lateral sub-fibular region. Radiographs failed to reveal any bony pathology or subcutaneous gas. Admission laboratory studies were performed. Results included a white blood cell count of 14,700 with 18% bands, hemoglobin and hematocrit of 13.8 and 39.3 respectively, sodium of 131, potassium of 3.3, and blood glucose of 197. C-reactive protein was markedly elevated at 23.6. Blood cultures were drawn and Gram stain revealed Gram positive cocci in chains (later identified as Streptococcus Group A). 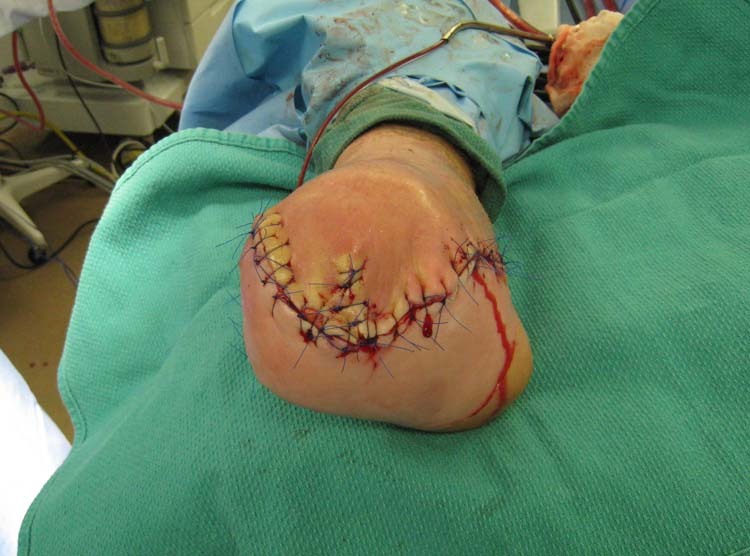 Figure 2 Intra-operative photo of the plantar incision and drainage showing extensive myonecrosis with minimal bleeding. Lack of resistance of fascial planes to blunt dissection was noted. 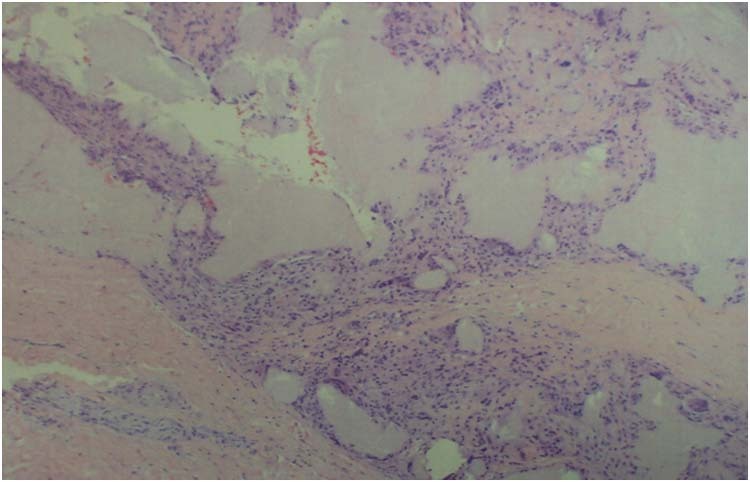 Multiple coagulated veins were present in the subcutaneous tissue. No bleeding occurred. 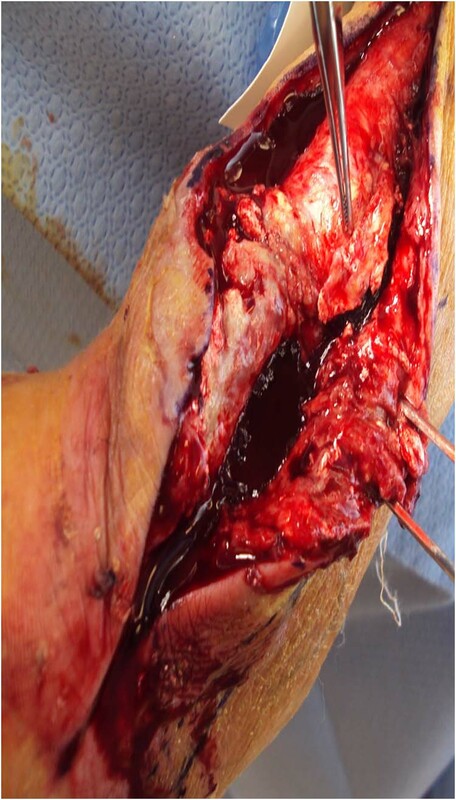 Following hydroscapel debridement and irrigation with pulse lavage, the wound was packed open with Iodoform gauze. The patient was placed on Linezolid, Clindamycin, and Aztreonam. Figures 3,4 Appearance of the foot after amputation of the fourth toe prior to the fourth surgical debridement. 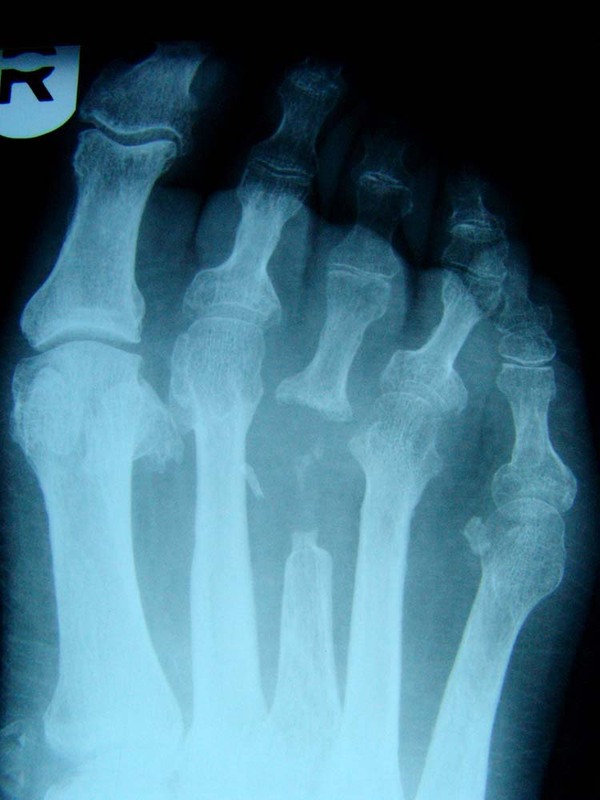 There is continued necrosis of soft tissue and loss of tissue viability to toes 1-3. Figure 5 After four surgical debridements with amputation of toes 2, 3, and 4, there is now viable bleeding tissue that is free from infection and necrosis. 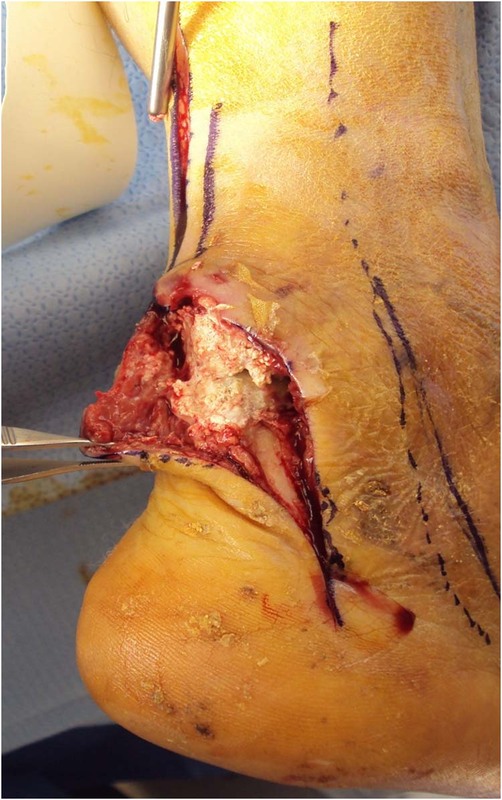 Figure 6 The forefoot was disarticulated at the LisFranc joint and the medial and lateral forefoot skin was used as a fasciocutanous flap to cover the defect. 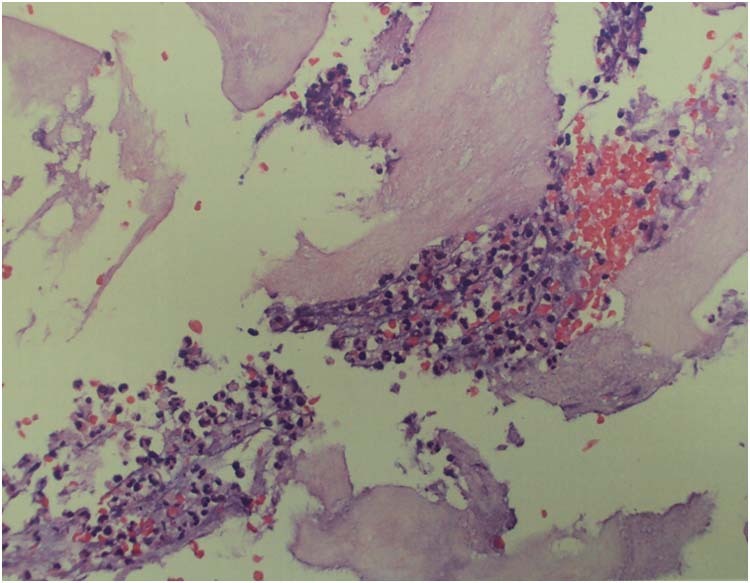 NSTIs are characterized by bacterial invasion leading to thrombosis and suppuration of the subcutaneous vasculature. The angiothrombosis effectively decreases blood supply, causing liquefactive necrosis of the subcutaneous tissue, fascia, and eventually the musculature. 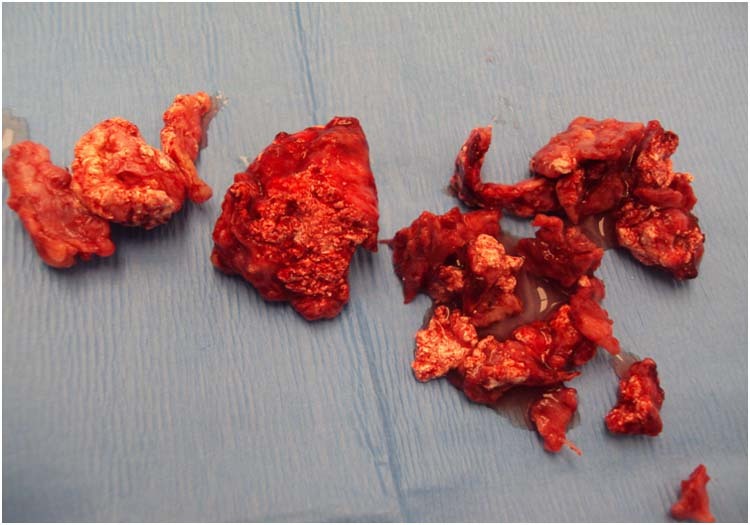 The angiothrombosis renders the delivery of parenteral antibiotic therapy ineffective, necessitating emergent operative debridement of gangrenous fascia, fat, and blood vessels to the extent of healthy, bleeding and viable tissue. Debridement reveals gray necrotic fascia, lack of bleeding during dissection, muscle fascia that gives way to blunt dissection, and foul-smelling “dish-water” purulence. The clinical course of NSTI is often not as rapid as would be expected from the media reports of “flesh-eating bacteria.” Although fever and tachycardia may begin at 24 hours, the pathognomonic features of skin sloughing, bullae, and cutaneous gangrene do not usually occur until the fourth or fifth day. [4,5,6] Our patient demonstrated this course of disease. McHenry reported the cumulative mortality of NSTI to be 34%. Death can result from disseminated intravascular coagulation, acute respiratory distress syndrome, or multiple organ failure in response to overwhelming sepsis. Anaya, et al,  found the most significant predictors of mortality to be white blood cell count greater than 30,000×103/μL and creatinine greater than 2 mg/dL. 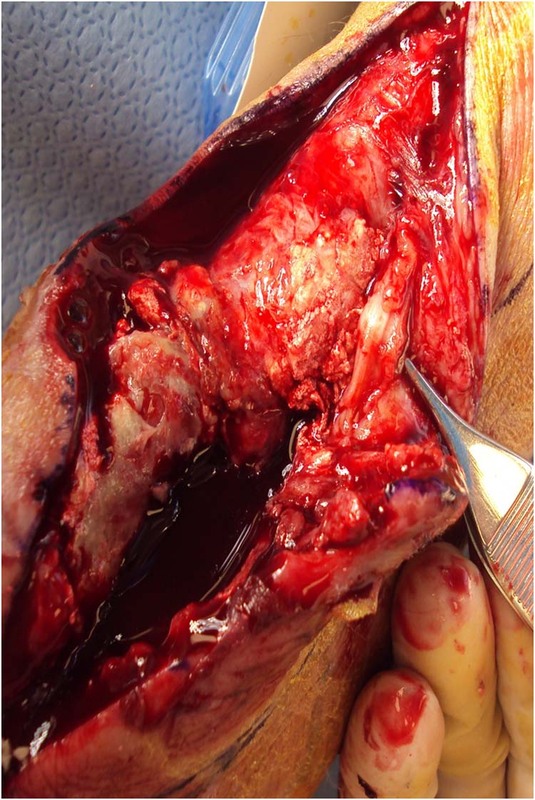 The single most important determinant of survival and limb preservation in NSTI is the amount of time elapsed between initial presentation and surgical debridement. McHenry reported the average time from admission to operation in non-survivors to be 90 hours, while in survivors the elapsed time was only 25 hours (p = 0.0002). In a retrospective review of 68 patients, Bilton, et al,  reported 4.2% mortality for patients undergoing early surgical debridement and 38.0% mortality for those with delayed treatment (p=0.0007). Wong and colleagues  developed the Laboratory Risk Indicator for Necrotizing Fasciitis (LRINEC) scoring system for accurately identifying NSTI based on lab values at time of hospital admission (Table 1). This scoring system was derived using univariate and multivariate logistic regression analysis of 89 patients with surgically confirmed NSTI and 225 control patients with cellulitis or subcutaneous abscess. 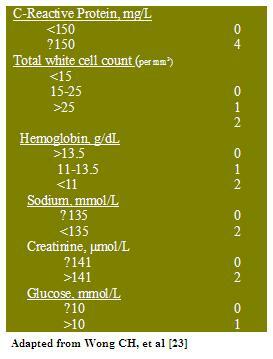 The LRINEC score considers the lab values for C-reactive protein, total white cell count, hemoglobin, sodium, serum creatinine, and glucose. For patients whose score was greater than 6 points (range 0-13), the LRINEC score had a positive predictive value of 92.0% and a negative predictive value of 96.0%. Patients were stratified into risk categories: low risk for a score of ≤5, moderate risk for a score of 6-7, and high risk for a score ≥8. The authors’ suggested algorithm for patients in the low risk category is intravenous antibiotics and continued monitoring of CBC and CRP. 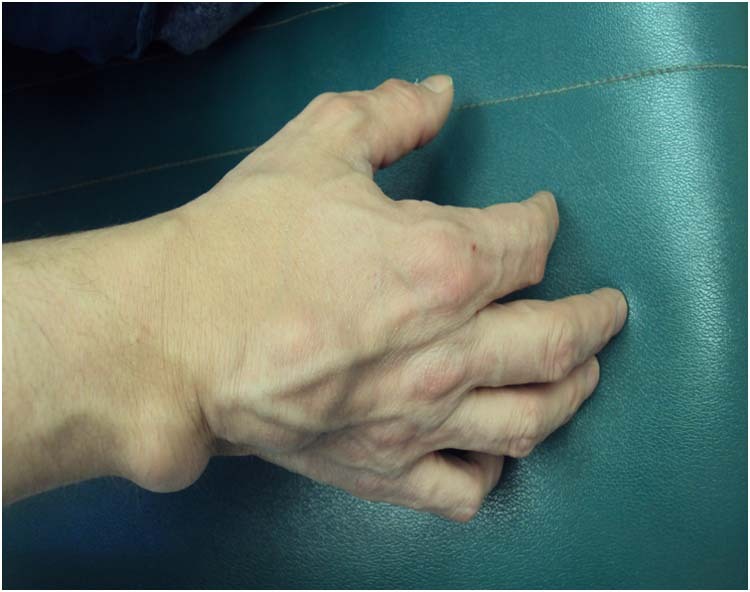 For intermediate risk patients, they suggest urgent MRI, frozen section biopsy, or “finger test,” a bedside procedure in which a 2-cm incision is made down to deep fascia and the wound inspected for lack of bleeding, presence of “dishwater pus,” and lack of resistance to blunt dissection. 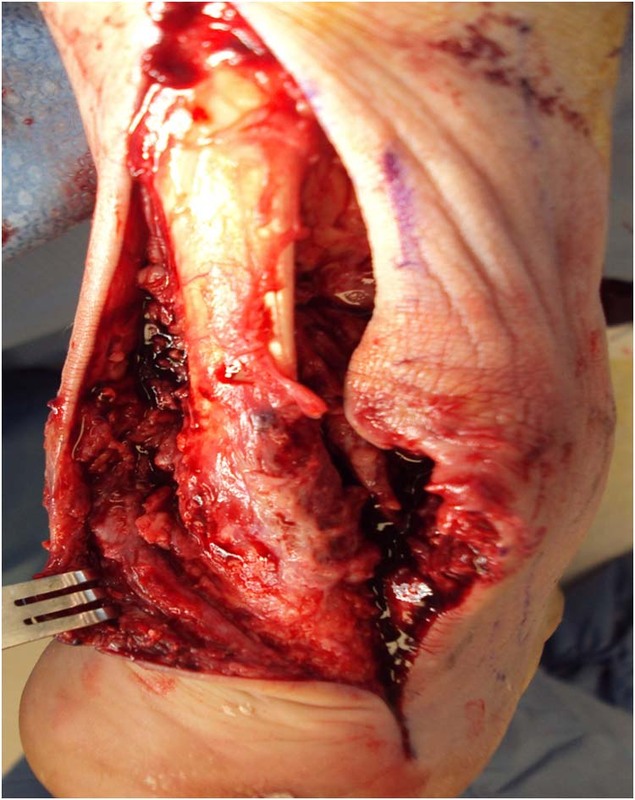 For patients at high risk with a score of 8 or higher, the recommendation is emergent operative debridement. Our patient presented to the Emergency Department with a LRINEC score of 7, placing him in the moderate risk category. The mainstay of treatment for necrotizing soft tissue infections is rapid surgical debridement followed by appropriate antibiotic therapy after initial resuscitation with fluid and electrolyte replacement and/or blood transfusion. Often multiple debridements are necessary. In the report by Wong, et al,  survivors underwent a mean of 2.7 debridements (range, 0-9) to control the infective process. While amputation was not found to reduce mortality, patients who underwent amputation had to undergo fewer operations to control the infection and to achieve wound coverage (2.59 compared with 3.45; p<0.05). Before cultures are available, empiric antibiotic therapy that is effective against gram positive, gram negative, and anaerobic bacteria should be initiated early. McHenry and colleagues  suggest using single antibiotics such as imipenem-cilastin, ticarcillin-clavulanate, ampicillin-sulbactam, or piperacillin-tazobactam. In their series, Bosshardt, et al,  employed triple antibiotic therapy consisting of ampicillin or high dose penicillin G, an aminoglycoside, and clindamycin or metronidazole. They suggested the combination of ampicillin-sulbactam and high dose penicillin G for drug abusers due to the higher percentage of infections caused by oropharyngeal flora and Clostridial species. The use of hyperbaric oxygen to treat NSTI may be beneficial. Wilkinson, et al,  reported a study of 44 patients with NSTI. Thirty-three patients received HBO2 in addition to standard care and eleven patients received only standard care. They found a significant reduction in the incidence of amputation (p=0.05) and an 83% reduction in the relative risk of death for the HBO2 group, which corresponds to a number needed to treat (NNT) of 3. The diagnosis of necrotizing soft tissue infection can be elusive and requires an astute clinician to recognize it in its early stages. This will help to increase the patient’s chance of survival and limb preservation. The clinician must realize that the pathognomonic skin changes do not appear until four or five days after initial presentation of pain, swelling and erythema. Though unconfirmed, we speculate that our case of NTSI was initiated by bacteremia from poor dentition. (Fig 7). Figure 7 A view of the patient’s oropharyngeal cavity exhibiting severe tooth decay and ginigivitis. In our case, rapid identification of the NSTI and septicemia contributed to our ability to preserve life and limb, through a foot sparing amputation. 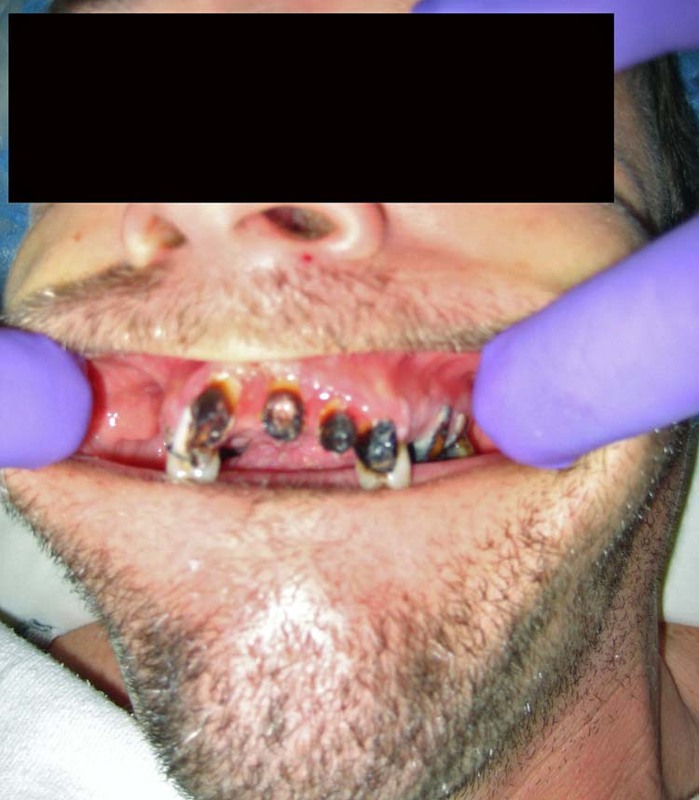 The patient underwent a dental consultation immediately following surgery to evaluate necrotizing gingivitis and severe tooth decay. 1. Jones J. Investigation upon the nature, causes and treatment of hospital gangrene as it prevailed in the Confederate armies, 1861-1965. In: Surgical Memories of the War of Rebellion New York: United States Sanitary Commission, 1871. 2. Wilson B: Necrotizing fasciitis. Am Surg. 18 :416-431, 1952. 3. Wong CH et al: Necrotizing Fasciitis: Clinical Presentation, Microbiology, and Determinants of Mortality. JBJS. 85-A(8): 1454-1460, 2003. 4. Beathard GA: Necrotizing Fasciitis Due to Group A β-hemolytic Streptococci. Arch Intern Med. 120:63-67, 1967. 5. Janevicius RV et al: Necrotizing fasciitis. Surg Gynecol Obstet. 154:97-102, 1982. 6. Koehn GC: Necrotizing fasciitis. Arch Dermatol. 114:581-583, 1978. 7. 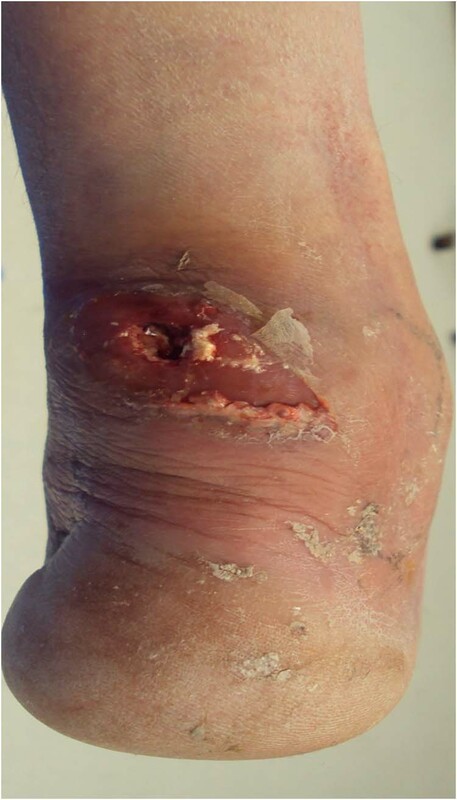 Giuliano, A et al: Bacteriology of necrotizing fasciitis. Am. J Surg. 134: 52-56, 1977. 8. McHenry CR et al: Determinants of Mortality for Necrotizing Soft-Tissue Infections. Annals of Surgery. 221(5): 558-565, 1995. 9. Singh G et al: Bacteriology of Necrotizing Infections of Soft Tissues. Aust N.Z. J. Surg. 66: 747-750, 1996. 10. 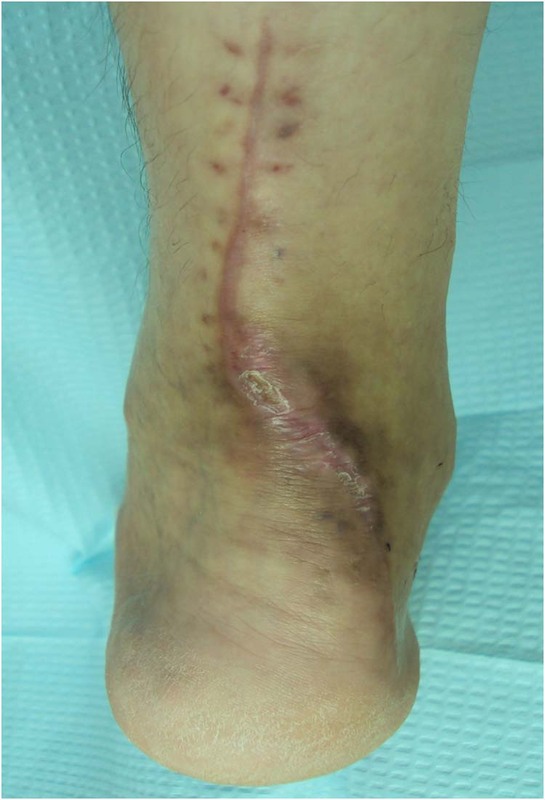 Wang KC et al: Necrotizing Fasciitis of the Extremities. J Trauma. 32: 179-182, 1992. 11. Elliott D et al: Necrotizing Soft Tissue Infections: Risk factors for mortality and strategies for management. Ann Surg. 224: 672-683, 1996. 12. 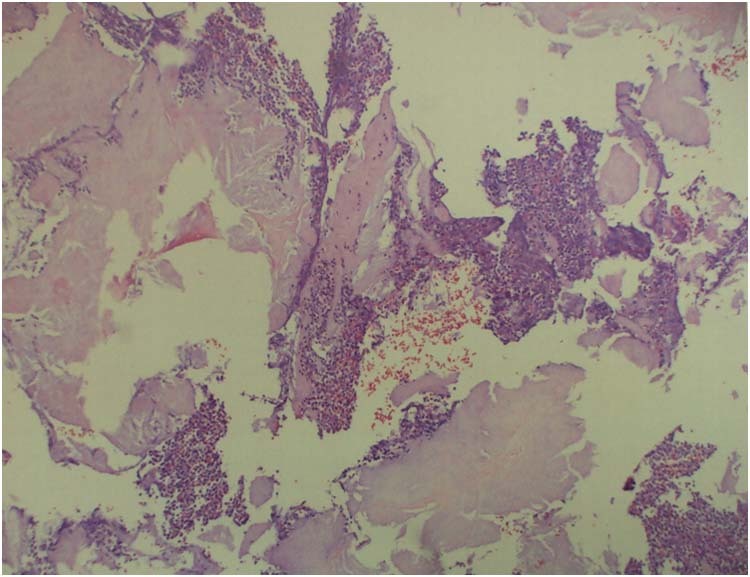 Bosshardt TL et al: Necrotizing soft-tissue infections. Arch Surg. 131: 846-854, 1996. 13. Wall DB; et al: Objective criteria may assist in distinguishing necrotizing fasciitis from nonnecrotizing soft tissue infection. Am J Surg. 179: 17-21, 2000. 14. 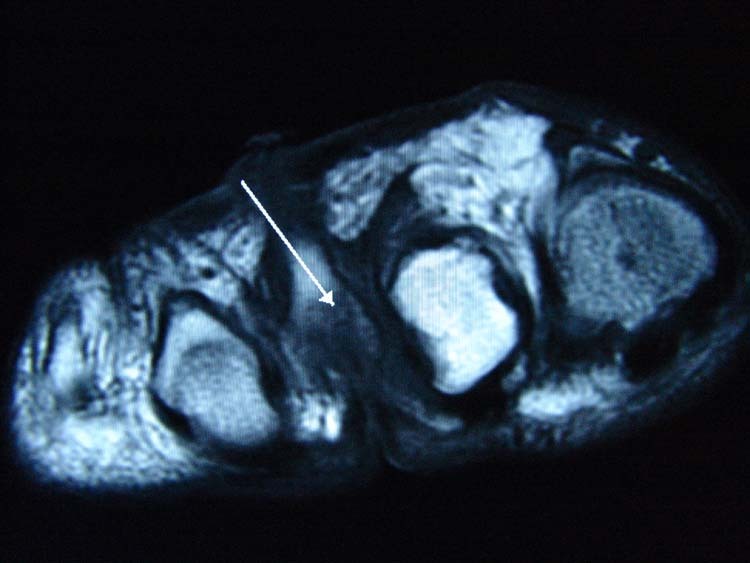 Tsai CC et al: Early diagnosis of necrotizing fasciitis by utilization of ultrasonography. Kaohsiung J Med Sci. 12:235-240, 1996. 15. Yen ZS et al: Ultrasonographic screening of clinically-suspected necrotizing fasciitis. Acad Emerg Med. 9(12): 1448-1451, 2002. 16. 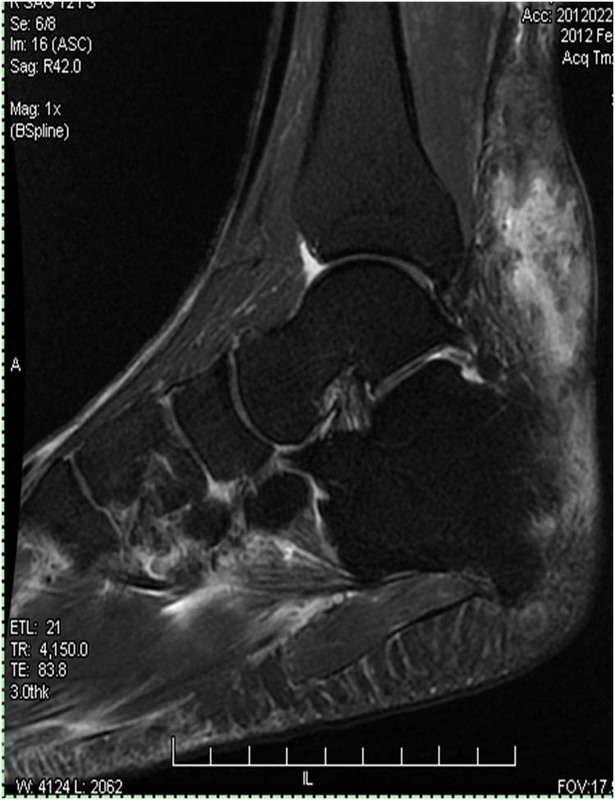 Wysoki MG et al: Necrotizing Fasciitis: CT Characteristics. Radiology. 203: 859-863, 1997. 17. Brothers TE et al: Magnetic resonance imaging differentiates between necrotizing and non-necrotizing fasciitis of the lower extremity. J Am Coll Surg. 187: 416-421, 1998. 18. 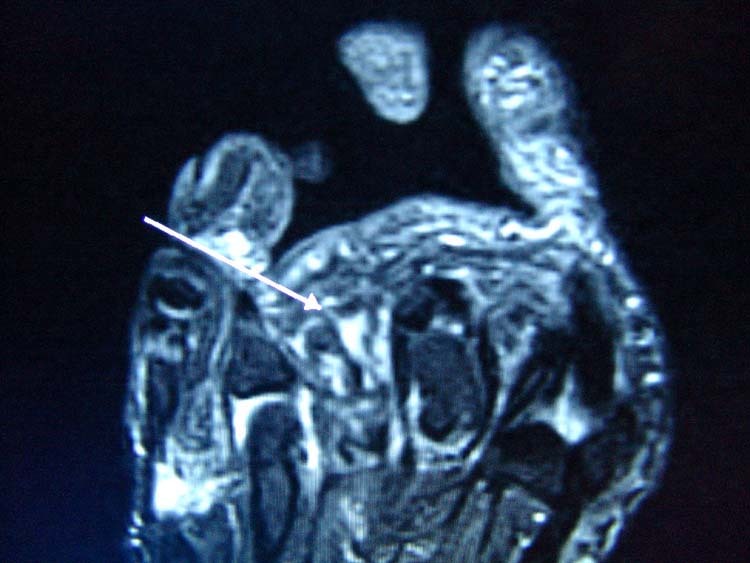 Schmid MR et al: Differentiation of necrotizing fasciitis and cellulitis using MR imaging. Am J Roentgenol. 70: 615-620, 1998. 19. Wang TL et al: Role of Tissue Oxygen Saturation Monitoring in Diagnosing Necrotizing Fasciitis of the Lower Limbs. Ann Emerg Med. 44: 222-228, 2004. 20. 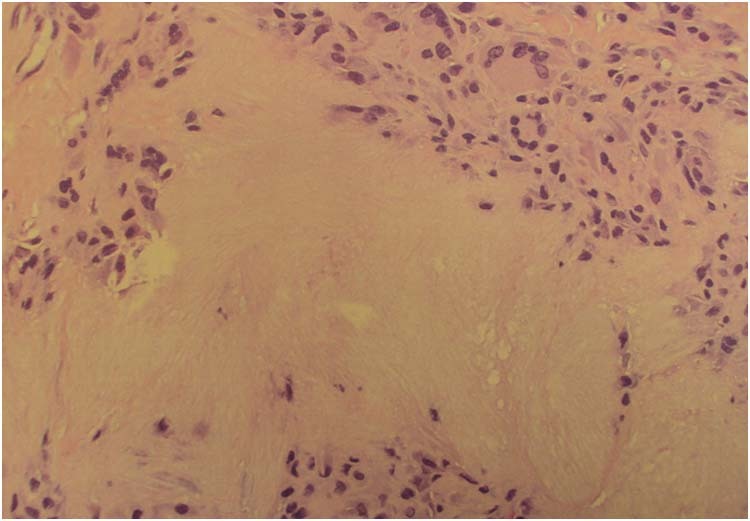 Fontes RA et al: Necrotizing Soft Tissue Infections. J Am Acad Orthop Surg. 8(3): 151-158, 2000. 21. Anaya DA et al: Predictors of Mortality and Limb Loss in Necrotizing Soft Tissue Infections. Arch Surg. 140: 151-157, 2005. 22. Bilton BD et al: Aggressive surgical management of necrotizing fasciitis serves to decrease mortality: a retrospective study. Am Surg. 64(5): 397-401, 1998. 23. Wong CH et al: The LRINEC( Laboratory Risk Indicator for Necrotizing Fasciitis) score: A tool for distinguishing necrotizing fasciitis from other soft tissue infections. Crit Care Med. 32(7): 1535-1541, 2004. 24. Wilkinson D et al: Hyperbaric Oxygen Treatment and Survival From Necrotizing Soft Tissue Infection. Arch Surg. 139: 1339-1345, 2004.